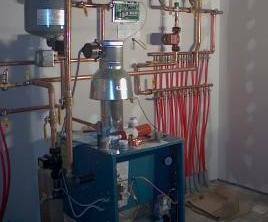 Hydronic baseboard heating systems mainly consist of the boiler to heat the water, pumps to transfer the hot water through the pipes and room heating units called baseboards (or radiators). Hot water baseboards contain a copper pipe with fins on it that carry hot water through the baseboard, transferring the heat in the pipe to the fins, which radiates the heat into the room. The heat from the baseboard convector warms the adjacent walls and the surrounding air from the bottom up. As the room air cools, it moves down and inside the heaters to be heated again. An imperceptible circulation of air is created to provide an even heat in the room. Hot water baseboard is an efficient heating system offering comfort, clean and even heat. 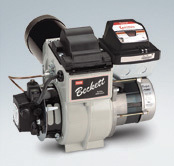 We have everything you need from the boiler to the baseboard heaters and everything to connect in between. 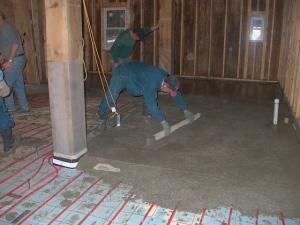 Another efficient and even heat is radiant floor heat. Here hot water produced by a boiler is pumped through a manifold PEX tubing that is either buried in a cement floor or placed under a tile or wood floor. The heat from the hot water circulating in the tubing is transferred to the floor, warming it up. The water cools as it moves through the tubing and returns to the boiler to be reheated. The warm cement, tile or wood floor radiates the heat throughout the room. This type of heating system has been around since early Roman days and is often described as one of the most comfortable heating types available. Parts can be found by clicking on the links below. If you can't find what you want, have questions or need help please contact us.